Posted on February 23, 2018 at 6:00 am. We begin today with WOLF PACK PRIDE! It’s been a long, hard season for the WMS Wrestling Team — but yesterday, it all came together. The Williamsburg Wolves scored a TREMENDOUS team victory over Gunston Middle School in their final regular season match of the year yesterday — 54 to 30. It was their FIRST WIN of the year, and creates some much-needed momentum heading into next week’s County Tournament. The Boys Cohort will be meeting on MONDAY during ASP 1 in room 233. It’s an opportunity for Black and Latino students to meet new people, and become LEADERS in our community. Allies are welcome, too! There will be a guest speaker next week, so don’t be late! See Mr. Hicks, Mr. Eason or Mr. Valdez with any questions. The 2017-2018 WMS yearbook is on sale NOW!! To get yours, just click the link on the WMS Website and complete the online order form. Yearbooks cost just 40-dollars — or for 55-dollars you can get the exclusive “Signature Package.” But orders MUST be received by next week, so get yours before they’re gone. See Ms. Briones with any questions. The WMS Yearbook — Don’t miss out on the memories! The National Museum of African American History and Culture opened to RAVE REVIEWS last year — and now YOU can see it for yourself! WMS is organizing a field trip to the African American Museum on March 9th. It’s open to all students — but space is limited, so it’s first-come, first-served. Just get a permission slip from the main office and return it by next TUESDAY. See Ms. Cameron or Ms. Mays with any questions. Don’t miss out of this amazing opportunity!! And now it’s time for our weekly segment: Champions of Change! Honoring the innovative, courageous, dedicated Americans who helped to shape the world we live in. Meet Alexander Miles, from Duluth, Minnesotta. Back in the late 19th century, elevators were downright DANGEROUS. Elevator doors had to be opened and closed manually — and there was a huge risk of accidentally falling down the elevator shaft. But Miles came up with a revolutionary new invention that made elevators infinitely safer. 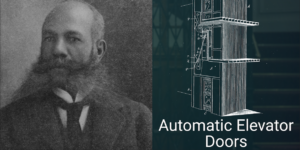 His patented design in 1887 triggered elevator doors to open and close AUTOMATICALLY, a basic safety feature still used today — more than 130 years later. Miles was inducted into the National Inventors Hall of Fame in 2007. His efforts truly make him a Champion of Change! Hey, WMS! It’s me, Annabel, and this is The Podium! Today on the Podium, I’ve got the latest rundown on the Winter Olympics in PyeongChang. Our American athletes have battled their booties off this week, but medals have been hard to come by. The US currently ranks FOURTH in the medal count — behind powerhouses Norway, Germany and Canada. But there have still been many notable performances to make us proud. 33 year-old Lindsey Vonn — in what was probably the final Olympic event of her career — took BRONZE in the Downhill, making her the oldest downhill skier to get a medal in Olympic history. Meanwhile, 17-year old skier Mikaela Shiffrin won her second medal of the Games, racing to the Silver in the Alpine. She looks to rack up plenty more medals in the 2022 Olympics and beyond. The Shibutani Siblings — aka the Shib Sibs — won bronze in ice dancing, their second medal in these Olympics after also winning bronze in the Team Event. And the women’s U.S. Hockey team SHOCKED THE WORLD on Wednesday, defeating Canada in the final match, 3 to 2, and winning GOLD for the first time in 20 YEARS!! As for Men’s figure skating… well… let’s just say they spent more time on their butts than on their skates. But it still made for great TV!! The 2018 Olympics wrap-up this weekend. Be sure to watch the Closing Ceremonies on Sunday night at 8pm on NBC — when the torch will finally be extinguished.That’s it for the Podium this week. Just keep skiing, Williamsburg! Finally today — the WMS Music Department is the biggest — and LOUDEST — elective program in our school. And the music students who participate don’t mind “tooting their own horns” one bit. Stay tuned as student-reporter Cameron M. turns up the volume on the WMS band, orchestra, and choir. Stay tuned for CNN 10 on WOLF-TV!